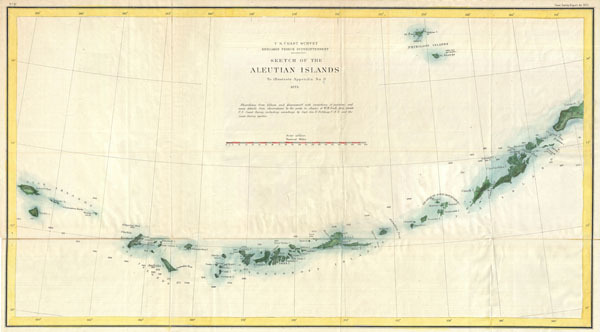 The first U.S. Coast Survey chart of the Aleutian Islands. Sketch of the Aleutian Islands to Illustrate Appendix No. 11. This unusual map is the U.S. Coast Survey's first significant mapping of the Aleutian Islands following the 1867 acquisition of the Alaska territory from Russia. The map covers the Aleutian Archipelago from Atta Island to Unimak Island and extends far enough north to include the Pribiloff Islands. Identifies each major island in the archipelago as well as important island groups, such as the 'Islands of Four Mountains' and notable naval passes, such as the Amukhta Pass. There are numerous but hardly exhaustive soundings illustrative of the embryonic state of the survey in this region. Produced under the supervision of Benjamin Peirce, Superintendent of the U.S. Coast Survey. Report of the Superintendent of the United States Coast Survey, Washington, (1873 edition). Good. Light overall toning. Verso reinforcement and toning on original fold lines. Blank on verso. Paper extremely brittle. University of Alaska Fairbanks, Elmer E. Rasmuson Library, Alaska and Polar Regions Collections, UAF-M0106.